While the only way to make the size of your room larger is to knock down a wall or two, there are ways to give it the appearance of being larger without going through all of that hassle. Instead of installing standard size tiles, increase the size to create the illusion of a larger square footage room. If you opt for larger tiles, select a pattern that does not include a border or design work along the edges. These details will have the same effect as small tiles and will break up the room. A smooth transition from wall to wall will create a freeflow throughout the room. By selecting a monochromatic color scheme, you’ll decrease the contrast in the room, which will give the appearance of a larger space overall. Having a flow of similar colors from the floor to the wall unites the space and creates a calmer aesthetic. Pop color in your décor to add your own personality. 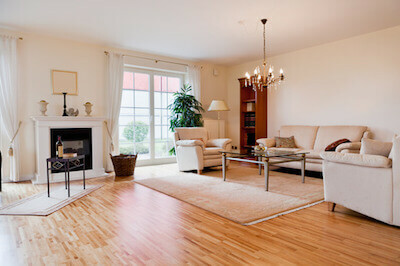 Just like utilizing larger tiles make a room look larger, wide plank hardwood will have the same effect. Installing wider planks will create less “seams” to break up the surface area, and will give the illusion of a larger space. You can choose wide plank hardwood, or select from wide plank stone which gives the appearance of hardwood, but with all the benefits of having stone tiles instead. A diagonal line from one corner of a room to the opposite corner is the longest straight line that can be drawn on a surface. If you install your flooring in a diagonal pattern, you will trick the eye into seeing the room as a larger space than it actually is. Dark flooring doesn’t have to create a dark, dingy room. The best way to utilize dark hardwood is to contrast it with light colored walls. The effect will move your line of vision up from the floor to the details in your décor. When combined with lots of windows for natural light, you can create just the right look. If your home has an open floorplan, it’s much easier to create a space that has the appearance of being larger than it is. Install the same flooring from room to room, which will give the illusion of one large space as it transitions from room to room.